In short, nonviolent direct action is the use of demonstrations and public forms of protest to focus attention on issues that those in power have refused to address. It’s a tool for those who hold less power in society. Participants intentionally leverage their freedom, comfort and physical safety to challenge those who do have the wealth and access to influence politics. Direct action is rooted in the philosophy of nonviolence, a positive force that addresses the unjust actions of those in power while also actively respecting the humanity of the people who do harm. There are six principles of Kingian nonviolence, the ideology formed from the direct actions of the civil rights movement and influenced by the work of Mahatma Gandhi. Public civil disobedience to bring attention to injustice can have a major impact, like when four young Black men risked their safety and freedom by sitting at a lunch counter at a Woolworth’s in Greensboro, North Carolina in 1960. Their direct action spurred more than 100,000 others to engage in direct action across the country to participate in similar sit-ins to protest racist segregation laws. Today, modern-day churches are providing sanctuary to undocumented families in violation of current immigration law. And of course, hundreds of thousands across the country participate in protests, marches (like ours at the Women’s March), banner drops, mic takeovers and other means of confronting power. Why is direct action important to women’s rights and the progressive agenda? A progressive agenda is inherently about making society more equitable and making space for people who have been historically marginalized and excluded to lead and thrive. A truly representative democracy is one with women leading in the halls of power and women advocating from the streets. Voting achieves the first. Direct action is a key part of achieving the second. That means that once we put people in positions of power, we have to hold them accountable. Direct action is an effective way to do that. It allows sympathetic voices within the halls of power to justify their support for the issues we’re advocating for, and it puts pressure on less sympathetic voices to comply with our demands. When the stakes are high – when children are being put in cages, when families are being torn apart, when toddlers are tear gassed, and when a sexual predator is being offered a seat on the highest court in the land – the #WomensWave must rise higher. When the threats facing our communities escalate, we too must escalate. Women have put their bodies on the line to obtain the right to vote, protest police violence, defend immigrant families, stand up to the NRA, keep a sexual predator off the Supreme Court, protect our planet and so much more. This tried and true tactic has always been part of progressive agendas. We can’t stop now. 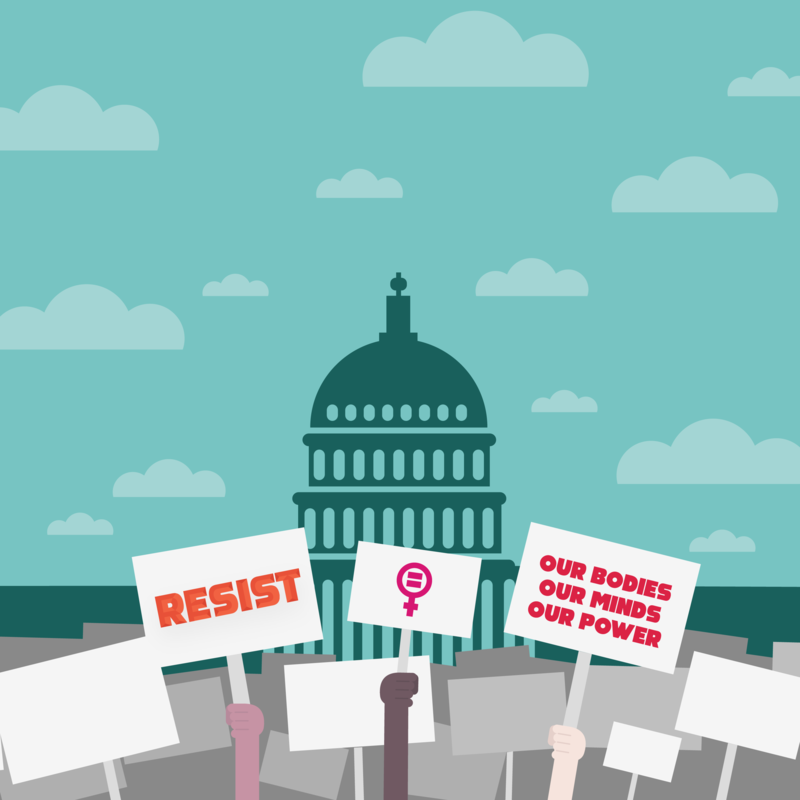 If you’d like to join our nationwide direct action in the fight for equality this month, please visit womensmarch.com to find a Women’s March event near you on January 19. And if you need a protest sign to carry at your march, CREDO has some great options that you can download and print out here.